After Thursday night’s loss to Miami, Notre Dame returns home to play another ranked ACC team when the Irish host #24 Florida State at noon Sunday. The Seminoles beat NC State on Thursday night to move into a four-way tie for second place in the ACC with the Wolfpack, the Hurricanes and the Irish. Florida State stands 20-3 overall with two of their three losses coming in conference against ACC-leader Louisville (by 19) and Clemson (by 12). The Seminoles have reeled off four straight wins since losing to Louisville. A narrow two-point win over Virginia Tech started the winning stretch, which also included a four-point home win against Miami and a five-point win over the Wolfpack. The Seminoles don’t pack as much offensive punch as North Carolina or Miami, but they will still be a formidable opponent for the Irish. Florida State averages 69.2 points per game while giving up 58. They shoot 41.4% from the field, 26.8% from three and 73.3% from the line. They average 5.4 made threes per game. Florida State averages 38.1 rebounds, 13.1 assists and 13.3 turnovers per game. Their opponents commit an average of 17.7 turnovers per contest. Kiah Gillespie, a 6’2” redshirt junior, leads FSU in scoring at 17.0 points per game. The former McDonald’s All American (MDAA) makes 47% of her field goal attempts. She’s also made 35 of 109 three-point attempts (32.1%). She averages 8.5 rebounds per game in 32.5 minutes of floor time. Nicki Ekhomu is second in scoring at 14.3 points per game. The 5’9” junior guard leads the team in assists with 89 and sports an assist to turnover ratio of 1.8. She shoots 41.1% from the field and has 28 made threes (30.8%). She makes 79.6% of her free throws. She averages 33.0 minutes per game. Wausia Woolfolk, who plays 31.0 minutes per game, is the Seminoles remaining double-figure scorer at 12.7 points per game. She’s made 27 of 107 three-point attempts on the season (25.2%). Freshman Valencia Myers, a 6’3” forward and MDAA, adds 9.1 points and 6.4 rebounds per game in 24 minutes of action. She shoots 45.6% from the field and 76.5% from the line. She leads the team in blocks with 39 for the season. The fifth starter is also a freshman — 5’10” guard Kourtney Weber. She averages 3.6 points in just under 21 minutes per game. She only makes 29.4% of her field goals, but has shot 65 threes and made 17 (26.6%). Florida State has been playing eight players the last few games. The three subs have been Morgan Jones, a 6’2” freshman, Savannah Wilkinson, a 5’11” sophomore, and Sayawni Lassiter, a 5’10” redshirt freshman. Wilkinson is from England and plays the most minutes — 23.8 per game. She averages 3.6 points and 4.6 rebounds per game. 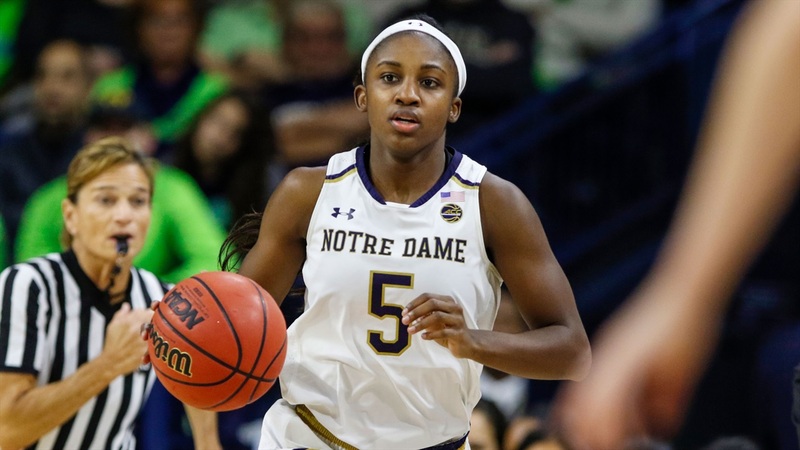 Irish Notes: While head coach Muffet McGraw complained about the Irish defense following Thursday’s game at Miami, rebounding and poor offensive execution were more significant issues. The Canes muscled and positioned their way to 21 offensive rebounds to produce extra possessions and stymie the Irish fast break. Nine of Jessica Shepard’s game-high 17 rebounds were off the defensive glass, but Brianna Turner only collected 3 defensive rebounds for the game. Florida State held the Irish to their lowest point total (65) and worst shooting performance of the season (37.3%). Coming into the game, the Irish had shot 51.9% from the field, third best in the NCAA. Notre Dame made a combined 15 for 31 (46.9%) over the first and third quarters in scoring 40 points, but the Irish were an anemic 7 for 27 (25.9%) in the second and fourth quarters for 25 points. Shepard was ND’s high scorer with 17 points — the lowest total for a point leader in an Irish game this season and just the fourth game in which at least one ND player failed to top 20 points. The Irish only had 11 assists for the game against 12 turnovers. The Irish assist average for the first nine ACC games was 21. Notre Dame only managed 28 points in the paint — the Irish have averaged 49.2 paint points for the season. The Irish limited Miami to 39.1% from the field and 18.8% from three. The Canes only shot 65.5% from the line, but made 5 of 6 in the last 24 seconds of the game to seal the win. Notre Dame’s leading scorer on the season has not performed well in the two recent road losses. Arike Ogunbowale scored just 13 points in each game making just 25% of her team-leading 36 field goal attempts and just 15.4% of her 13 tries behind the arc. In contrast, Jess Shepard made 14 of 25 (56%), Brianna Turner was 9 for 15 (60%) and Marina Mabrey made 12 of 24 shots overall and 6 of 13 three-point attempts. Comparing the five home and five ACC road games so far this season, Ogunbowale is shooting 46% from the field, 40% from three and 88% from the line at home, and just 31.3% overall, 18.5% from three and 66.7% from the line. In spite of an off night last night, Mabrey is shooting 56.3% from three at home and 50% on the road and Jackie Young is actually shooting better on the road in ACC play at 58.1% vs. 50.9% at home. However, she’s only taking 7.8 shots on the road vs. 10.6 at home, so her points per game are 11.8 on the road vs. 14 at home. She did score 14 at Miami. One Irish player who has stepped up her performance on the road is Jess Shepard. After leading the team with 17 points at Miami, her points per game across the five ACC road games is 18.0 vs. 10.6 at home. She’s shooting 67.3% in road games and 51.4% at home. One other positive note on Shepard, she’s made 32 of 40 (80%) of her free throws across the ten ACC games including 17 for 19 on the road (81%). Sunday’s game vs. Florida State is scheduled for a noon tip-off and will be televised on ESPN. In-game updates will be posted below.